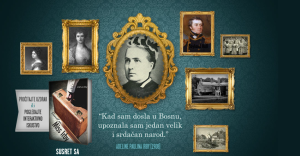 A few months ago, in September 2011, Sarajevo (Bosnia and Herzegovina) protestant churches organized a cultural and an evangelistic event called “Meeting Miss Irby,” commemorating the centenary of a death of Miss Adeline Paulina Irby, 100 years ago. Miss Irby was a protestant missionary who came to the Balkans 150 years ago. She first travelled extensively the region along with Georgina Muir Mackenzie. In 1859 they originated from Vienna, travelled through Bratislava, stayed for some time on the Tatra Mountains, and then went to Cracow, just to be accused by the Austrian authorities that they are suspected Russian spies and Pan-Slavism movement supporters. They later travelled the Balkans and published a much apprised book called “The Slavonic Provinces of Turkey-in-Europe” and upon return to the UK, they gave lectures and published papers on these Slav groups: Bulgarians, Serbs, Croats, Bosnians, etc.